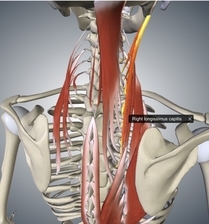 Longissimus Capitis belongs to the intermediate column of the Sacrospinalis group of muscles. 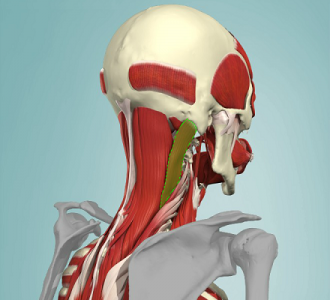 Posterior surface of transverse processes of T1 to T5 and the articular tubercle of C4 to C7. Posterior margin of mastoid process and the temporal bone. Dorsal rami of cervical and thoracic spinal nerves (C6 to T4). 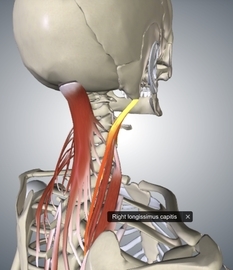 Muscular branches of the occipital artery from the external carotid artery. Acting bilaterally, extends and hyperextends head; acting unilaterally, flexes and rotates the head ipsilaterally. 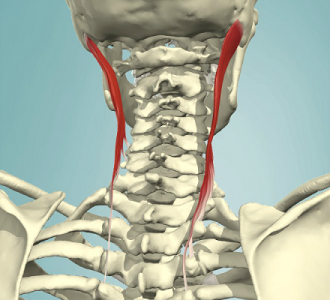 Pain is usually referred around the ear, but can also refer nearby into the neck and behind the eye. ↑ Gray, Henry. Anatomy of the Human Body. Philadelphia: Lea & Febiger, 1918; Bartleby.com, 2000. www.bartleby.com/107/.